Wow, that is a mouthful of a name for a top coat. 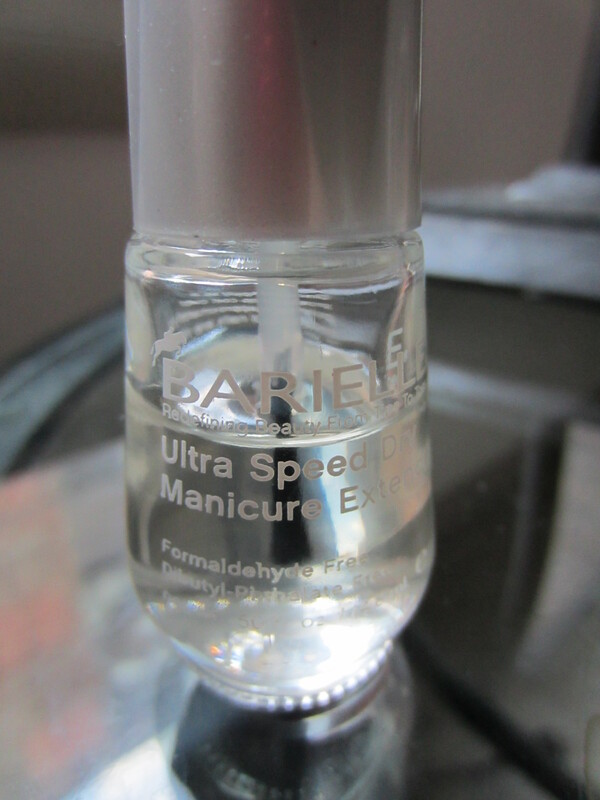 I picked up the Barielle Ultra Speed Dry Manicure Extender Top Coat a few weeks ago when Barielle was on sale on Hautelook.com for 50% off. I ended up picking up 3 polishes and this top coat in that order and couldn’t wait to try out this top coat. They had two that were available during that sale, the No Chip Speed Dry top coat and the Ultra Speed Dry top coat, and I figured I’ll go for the one that seems a little speedier. But I have to say, I’m very shocked and a little disappointed with this purchase. This review is going to be short and sweet and straight to the point. This top coat isn’t ultra speedy at all. Compared to Sally Hansen Instra-Dri and Seche Vete, this stuff isn’t speedy at all. My nails are still tacky to the touch a good minute or two after applying this top coat and I am spoiled with the other amazingly fast top coats on the market. Actually, I am not really comfortable touching anything for a good 5 minutes because I will smudge my manicure. I used this as my top coat this morning and I made sure that my nail polish color was 100% dry before applying the Ultra Speedy Dry because I knew that I still needed to get dress and even 30 minutes after using it I went to go get dressed and ruined my entire manicure. I’ve never had that problem with other quick dry top coats so this isn’t getting high remarks from me. The consistency is alright, it is a little thin but most speed dry top coats are and then they thicken up. So far I have used about a third of the bottle and it hasn’t started to thicken up yet, like Seche Vete starts to do. It seems to do a fine job at keeping my nails from chipping but what I have to complain about the most and why I am writing this review is because I had a major incident after using this top coat one day. I am a big fan of candles and I always have one going in my apartment. The second time I ever used this top coat, I painted my nails a few hours before I went to go light a candle. My manicure was completely dry and I had been doing things around my apartment for a few hours. The candle I was lighting was close to the end of it’s life and I had to tip the candle back in order to reach the wick at the bottom. Once I struck the lighter to light the candle two things happened: I lit the wick and also caught my nail of fire! My thumb nail caught fire! Look at this picture! I’m still in shock about the fact that my nail caught on fire and I’m not just talking that my nail polish melted, I had an actual flame coming off my thumb nail. I am not an idiot, I know nail polish is flammable but I have been painting my nails and lighting candles for a pretty long time and never once have I had my dry nail polish catch on fire. What would happen to cause dry nail polish to catch on fire? I don’t understand how this could happen but I had to blog about it because that is the most off the wall, crazy thing that has ever happened in the course of this crazy obsession of mine. 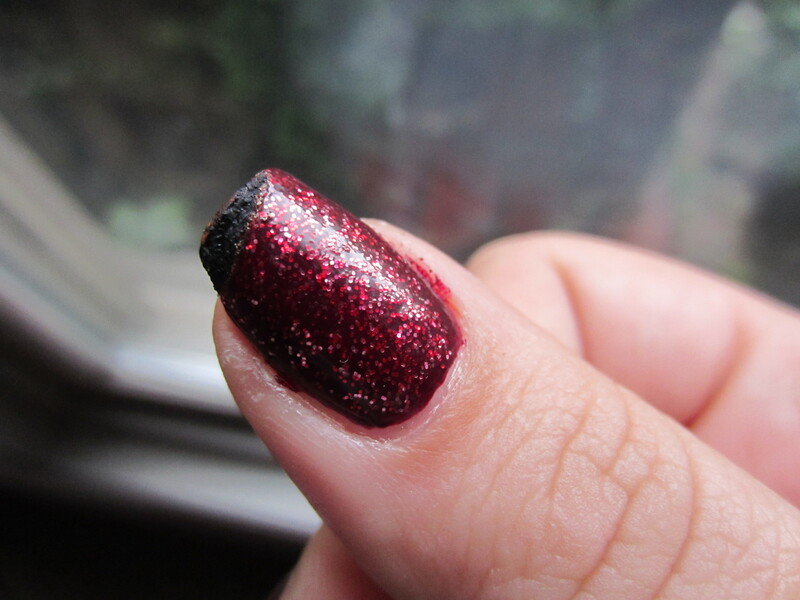 Dry nail polish that catches on fire is something that I need to tell people about. I had to file this nail down to get rid of the damage that the fire caused and I can still see some damage that this caused. Since then, I’m scared to get too close to the stove while cooking and lighting any other candles around my apartment. This retails for $16 and I have never ever found this at any store so for me and where I live, it is only available online. The price mixed with the fact that is it insanely flamable just made this something that I will never recommend and will never purchase. I can get Seche at my local drug store for $10 and it dries my nails completely in less than a minute, with no worries of smudging. And with Seche, or any other top coat I’ve ever used, I don’t have to worry about catching my nails on fire when a light candles! Since I’m not ready to give up candles in my apartment, I will be giving up this top coat once I’ve used up the bottle. I’m not comfortable telling people what to buy and what not to buy, but I am comfortable showing pictures of what happened to me when using certain products. Buyers beware if you are a woman who likes to cook or light candles and if you want to try this out for yourself, I won’t stop you. Just know I won’t be repurchasing this.